This week, the news outlets are running the usual lists of those who have died over the course of the year. Pro-Lifers lost a once-great potential ally in the person of Senator Edward Kennedy. When radical feminism began to dictate political longevity in the Democrat Party, Teddy caved. Kennedy is an interesting profile in character. 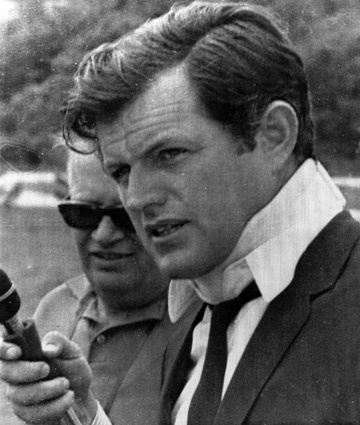 Did his actions at Chappaquiddick set him off on the trajectory that he took on the life issues? The great tragedy of Ted Kennedy is that he actually ‘got it’ on the the issue of abortion. I appreciate your letter containing your views on abortion. There are many moral and legal aspects arising from this complex issue which is gaining the acceptance of large numbers of women faced with unwanted pregnancies, while disturbing the consciences of a great many other Americans. Opponents maintain that abortion is wrong from every theological, moral and medical aspect. Proponents are firmly convinced that the woman, alone, has the right to decide. While the deep concern of a woman bearing an unwanted child merits consideration and sympathy, it is my personal feeling that the legalization of abortion on demand is not in accordance with the value which our civilization places on human life. Wanted or unwanted, I believe that human life, even at its earliest stages, has certain rights which must be recognized — the right to be born, the right to love, the right to grow old. On the question of the individual’s freedom of choice there are easily available birth control methods and information which women may employ to prevent or postpone pregnancy. But once life has begun, no matter at what stage of growth, it is my belief that termination should not be decided merely by desire. I share the confidence of those who feel that America is willing to care for its unwanted as well as wanted children, protecting particularly those who cannot protect themselves. I also share the opinions of those who do not accept abortion as a response to our society’s problems — an inadequate welfare system, unsatisfactory job training programs, and insufficient financial support for all its citizens. Then Teddy flipped. Some call that “Growth in Office”. Yes, cancer does seem to grow, and metastasize. Now we are dealing with a Democrat party building “death panels” into medicare, mandating that all Americans pay for abortions. Metastatic cancer knows no limits. All pro-lifers need to pray for Teddy. None should wish him the denial of Paradise. He needs more prayers because his sins were so far reaching:derailing pro-life judicial nominees such as Robert Bork, while packing the judiciary with the likes of Ruth Bader Ginsburg. For Teddy, we pray that beautiful prayer for those who undergo their purgation before entrance into the fullness of life. have mercy on the soul of Thy departed servant Edward. and do Thou O merciful Saviour send the angels to conduct him to a place of refreshment, light and peace. Amen. Not many people have done more damage against the rights of the unborn than Ted Kennedy. ..and he got a pass from the Catholic Church year after year and year, and vote after vote after vote. yeah, well Jasper that “pass” likely didn’t carry into eternity. so you can rest easy…..